Once again offering a premium take on buybacks, 2016 Leaf Best of Basketball returns to the fold with a fresh batch of NBA delights. Hobby boxes feature one repurchased card and one original Leaf card. 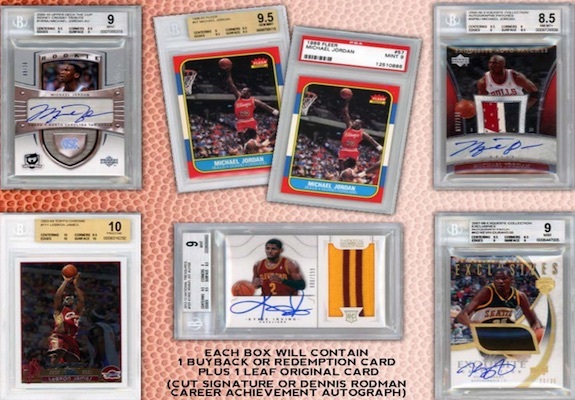 Showcasing a virtual cornucopia of premium cards, Best of Basketball includes a strong mix of autographs, memorabilia cards, and graded stars and rookies. The includes key names like Michael Jordan, LeBron James, Kevin Durant and Kyrie Irving, among others. There are also limited redemptions for high-end sealed product that takes the place of the buyback. Found in each box, the original Leaf options include a 2016 Leaf Best of Basketball Hall of Fame Cut Signature or Dennis Rodman Career Achievements Autograph. Collectors will find one of these choices in addition to the buyback card.